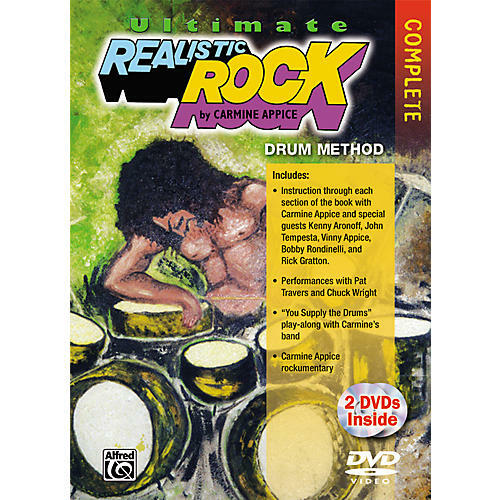 Hosted by Leslie Gold, the Radiochick, this jam-packed 2-DVD set includes step-by-step instruction through each section of Carmine Appice's award-winning book, Ultimate Realistic Rock. Featuring instruction by Carmine himself, with special guests Kenny Aronoff, John Tempesta, Vinny Appice, Bobby Rondinelli, and Rick Gratton, topics include basic rock rhythms, sixteenth-note triplets, syncopation, hi-hat rhythms, shuffle rhythms, double-bass drum grooves, odd-time grooves, and linear rudiments. Also included are performances with guitar legend Pat Travers, a "you supply the drums" play-along section, and a Carmine Appice rockumentary chronicling Carmine's celebrated career in the music business.